In this latest video, users are seen testing the most recent prototype of Google Glass using voice commands. Users direct the glasses to take pictures or videos, plot maps or access social media using a lens display. In one sequence, a user activates a "video chat" allowing his friends to see through his glasses. Google glasses are eyewear that operate like a smart phone. The "augmented reality" glasses were developed by the Google X Lab, the group responsible for creating advanced technologies such as the self driving google car. The glasses are slim, lightweight eyewear that can perform any smartphone app or function. The concept behind the glasses is to provide users with a hands free means of obtaining and displaying information instead of using a smart phone. The hardware is contained within a thicker arm of the glasses. Users talk to their eye wear to access images on a lens display, which is synchronized with audio resonating from the frame. You can send texts, emails, access the web, check weather, take pictures, chat or anything else you do with a smart phone. Prototypes have been tested in public for the past three years. Google co-founder Sergey Brin has appeared in public wearing early prototypes of the glasses. Below is a video demonstrating uses Google envisions for their glasses. According to electrical engineer Babak Parviz, geolocation specialist Steve Lee, and artificial intelligence expert, Sebastian Thrun, all members of the Project Glass team, they're releasing videos and information to get feedback and suggestions from the public. In fact, Google is having a contest. You can apply here. Angeles.Contestants must be 18 years of age and reside in the United States. 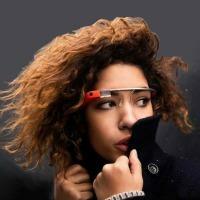 Google expects to launch their glasses in 2014. The concept for digital eyeglasses is not new and Apple also has patents on similar technology. The iPhone 4S already uses voice recognition technology - an advanced "siri" technology that not only understands what you say but can comprehend your meaning and can even have a conversation with you. It can write emails, text, do web searches and so forth. Some of the eye wear patents include accelerometers and motion sensors, which provide alternative methods of communicating with the glasses besides talking to them. Advancing technologies have largely overcome concerns regarding wearable eyeglass smartphones. Users have no blind spots or interference with peripheral vision. The glasses are light, slim and fashionable so users would feel comfortable wearing them in public. A thieve could steal your credit card information if it has a RFID (Radio Frequency Identification) chip. Credit and debit cards have RFID chips that make them easier to use. You can just wave the card close to a payment terminal and your information is picked-up by radio waves. There is no need to swipe the magnetic strip on your card. These RFID enabled "smart cards" have a "paypass", "paywave" or "expresspay" icon on them. The problem with these "chips" is that they're easy to a scan. Anyone with a portable handheld scanner, which you can easily buy online, can wave it near your card and get your information. These chips are also used in driver's licenses and passports to make it easier for authorities to scan you but it also makes it easier for identity thieves to scan you from almost 50 feet away. To solve the problem governments have been issuing protective sleeves that prevent your documents from being read until the sleeve is removed. But what about your credit and debit cards? Well, radio waves can't penetrate aluminum so if your cards are wrapped in aluminum then your safe from scanners. Better still, get an aluminum case for your cards. There are inexpensive aluminum cases (security wallets) that are designed to conveniently hold and protect 9 cards from RFID scanners. Streaming 3D performer on stage with live band.